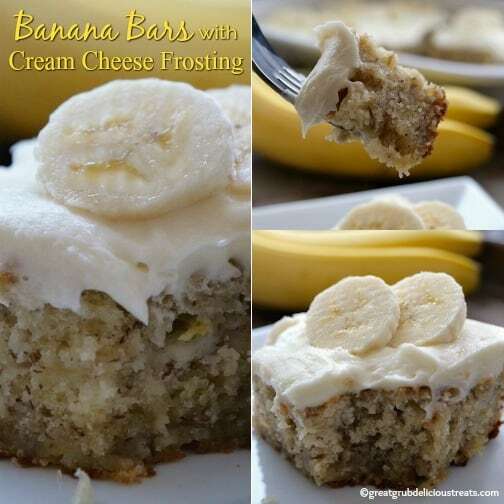 If you are a lover of banana then this is a great recipe to try, banana bars with cream cheese frosting. So yummy! 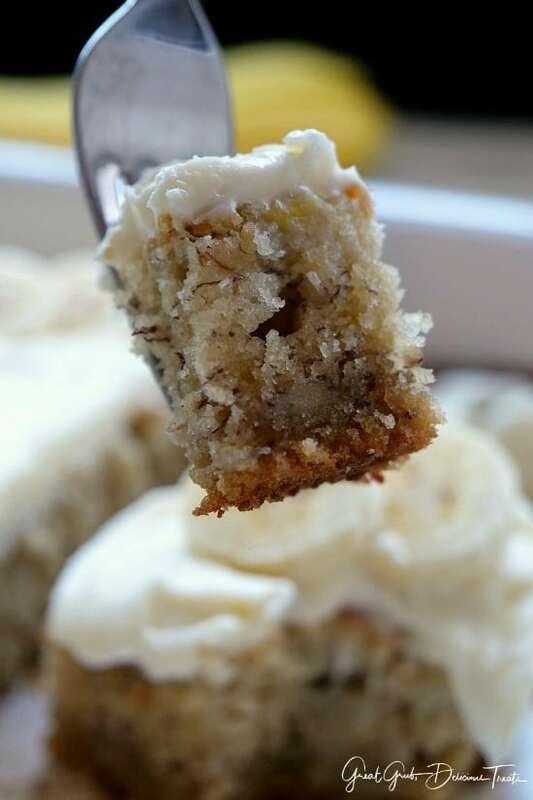 The homemade banana bars are so incredibly delicious and then topped with a cream cheese frosting, so good. 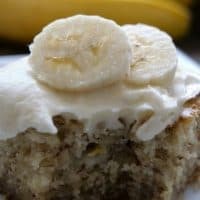 Fresh banana bread, cakes and bars are so amazingly delicious and these banana bars with cream cheese frosting will not disappoint. Super tasty and extremely moist, the banana flavor explodes with each bite. 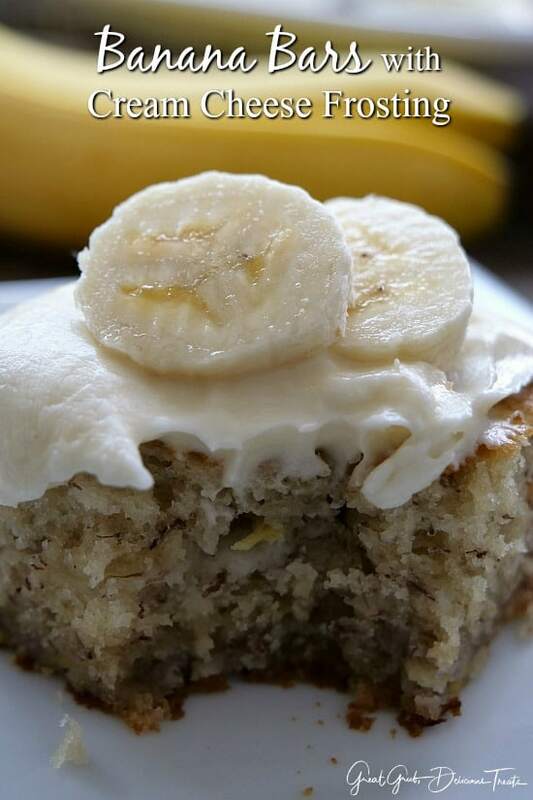 So the next time you have ripe bananas sitting on your counter, remember this tasty recipe. You will be so glad you did. Super easy, super delicious, and they will disappear just like that, they’re that good. Also, these freeze well and are perfect for a delicious snack later on. 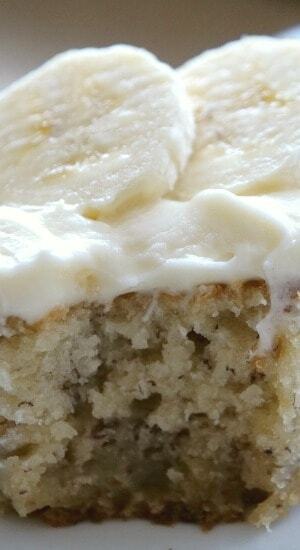 Homemade banana bars with cream cheese frosting, totally the best. 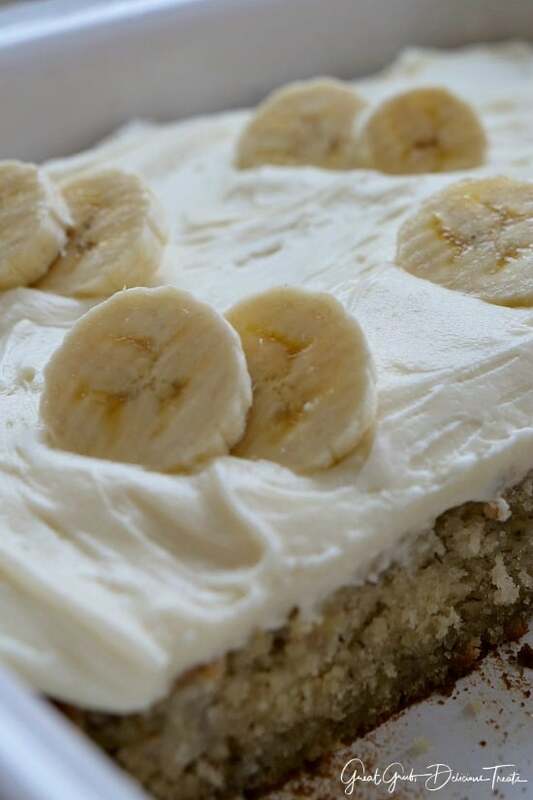 So banana lover’s out there, you are going to LOVE this super easy, homemade, incredibly delicious banana bar recipe loaded with bananas, deliciously flavored and with the creamy cream cheese frosting. Heaven! This recipe is from my sister, Linda. I had asked her for her banana bars recipe a couple of weeks ago because I remember how delicious they were. She’s been making these banana bars forever it seems and I needed to use our bananas before they were too ripe. Anyways, Linda sent me her recipe for which I am grateful because these are so delish. I used my own cream cheese frosting recipe which I absolutely love and together this is a winning combination. Linda also gave me a few other recipes which I will post soon. All are delish! Thank you sister! 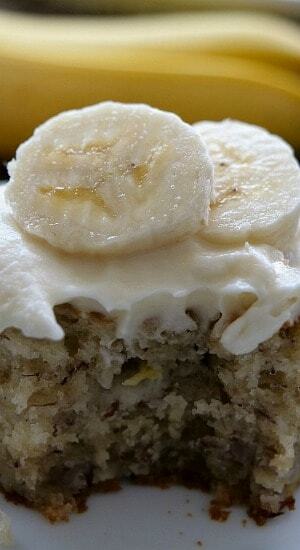 Here are a few more delicious banana recipes you can find on the blog: Banana Poke Cake, Banana Nut Cupcakes with Cream Cheese Buttercream Frosting, Chocolate Chunk Banana Nut Bread, Banana Nut Filled Pancakes, and Banana Nut Cream Cheese Cupcakes plus more. Recipe from my sister, Linda. 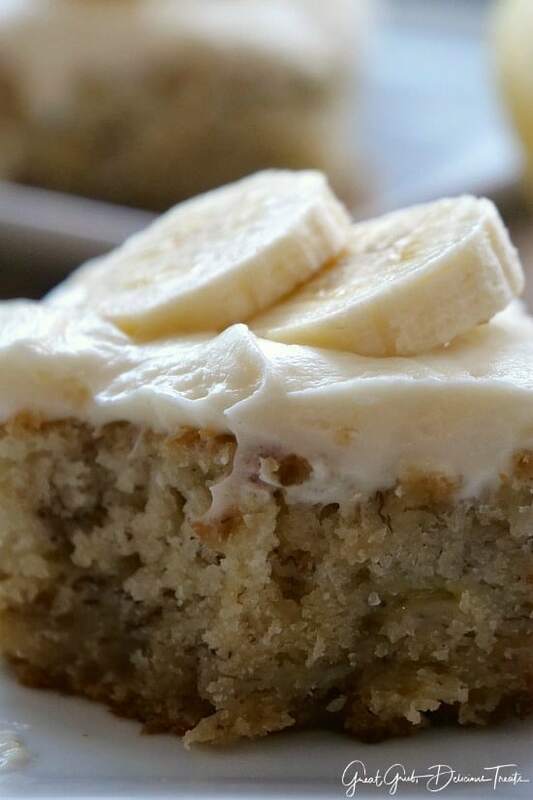 She always makes these delicious banana bars that are to die for! Preheat oven to 350° and spray a 15 x 10 jelly roll pan or a 13 x 9 baking dish with a non stick spray. Set aside. In a medium mixing bowl, beat butter and sugar together until creamy. Beat eggs, one at a time, into mixture. Combine flour, baking soda and salt in a small bowl and stir into wet ingredients. Pour batter into a 15 x 10 jelly roll pan or a 13 x 9 baking dish. *If using a jelly roll pan, bake 22-27 minutes, or 35-40 minutes in a baking dish, or until wooded toothpick come out clean. Remove from oven. Cool completely then frost. A new favourite dessert for the kids and I even my fussy one loved it but shhhhhh I didn’t say anything about the cheese and he didn’t realise he was eating it! Incredibly delicious for sure! Love this take on a sweet classic and banana desserts are so good! The cream cheese frosting is smooth and amazing and pairs perfectly! I make banana bread often but now that I have this recipe it has become my new favorite way to use up ripe bananas. The frosting is heavenly. Thank you for a wonderful recipe! What an easy and tasty recipe. We loved these bars and especially that frosting. We will be making these again. Hi Colleen, I used all purpose flour.